nope, not seasick :D. But as you might have noticed this scene, as did my last two, has a green background (although the last and this one not very noticable, while they're quite green in person), so I guess I'm a bit in a greenzone. I've always loved green, mostly the mossy and olivekind of shades, but never used it in mini-scenes before recently. I like it! 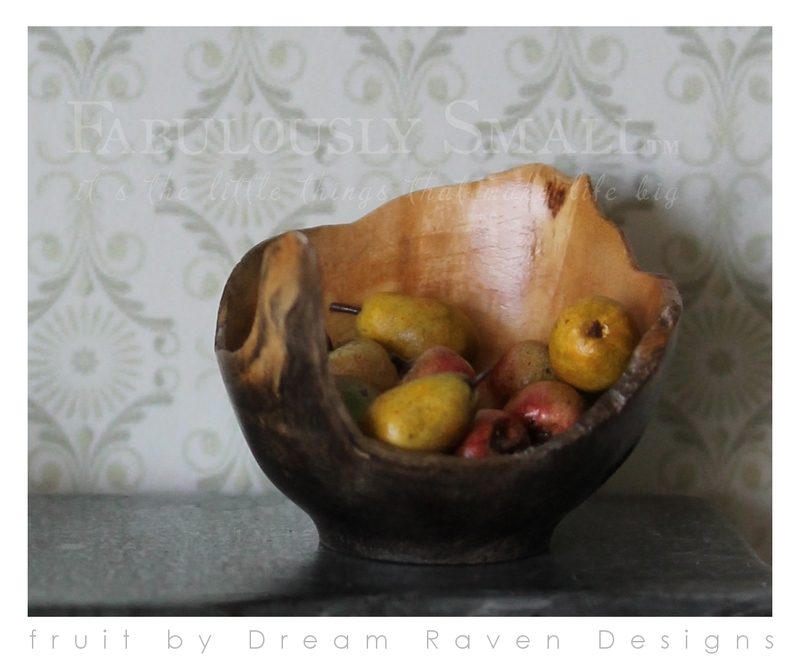 the wooden fruitbowl - it's maple - is not what I had in mind for this scene as you can see below. But remembered having it again and finally having some fruit because of that other bowl, just wanted to try this one out too. It turned out I liked it even more..
when I came across it I ordered it for the Oldtique Store, but because I liked it so much, for the time being just gets it's own little scene. And although being great on it's own, I thought it would be nice to have some fruit in it. and that's where Dream Raven Designs on Etsy comes in. Great name by the way. I was sold when I saw her beautiful and very realistic looking fruit (she also has lovely vegetables)! She opened her Etsy shop in the summer of last year, so she's new to it, but I predict (and hope for) a very succesful future for her. It would at least make sense: as you can see she's good!! Mentioning her here might help a bit I guess. 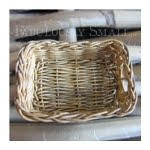 She also has a website and takes custom orders. while the fruit started out as filler for the bowl, I think they've ended up steeling the show, I just LOVE it! as mentioned at the beginning of this post, I thought I'd try out another bowl as well. One I've had for a couple of years now that I wasn't too sure about. But seeing it in these photographs, with some fruit in it, I think it's awesome! It's very thin, which is what I didn't like about it when I received it, it just seemed too flimsy. I never realized it's what makes it exactly right to scale and in the photo's the thickness is just perfect! And of course it had been missing some fruit :D.
I don't know the maker, the webshop didn't say, just 'maple wood bowl #A' and that it's made in the US. I ordered it in 2012 at Swan House Miniatures. He still has other ones if anyone is interested (not as great as this one I think though, sorry.. ;) ). Whoever has made it, he/she is amazing to be able to make a bowl so thin. It must have been very difficult without destroying it somewhere in the process. If anyone might know his or her name, please let me know and I can add it here to give credit for this gorgeous piece of work. the lamp is one I changed over time too and I'm really happy with how it turned out. Although it has some nasty superglue-stains on one side on the inside because I keep forgetting not to use superglue with glass and transparant plastics :(. But I did forget, there's no ctrl-Z in real life :D and haven't been able to get rid of most of it on the quite uneven surface. So I just decided it's the 'glass' being tarnished over time, being an old industrial-type lamp an' all :D. The original lamp is from Dolls House Emporium and for as far as I know is discontinued. And to be honest I don't think that's a bad thing.. (no offense DHE, but the size and ratio of this lamp is way off). when seen like this it looks great right? Although I'm personally not a fan of shiny brass, but that is easily fixed. 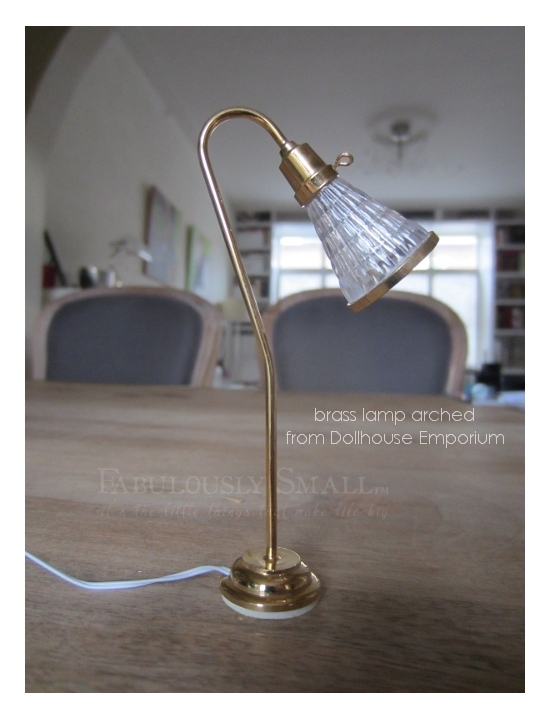 I know I can be picky and quite critical about the miniatures I use, but I'm pretty sure that's not it with this lamp.. I can't use it in a scene without looking way off, as you can see. Not as a tablelamp and not as a floorlamp; it's both weird I think. but that's okay as it's been the lampshade I always liked most about this lamp anyway, so after a bit of thinking I thought I could use that to make it into an industrialtype pendant. And then it's bigger shade is also fine. Although a bit too big for above the dresser in the scene above, I think it still works and really liked having a lamp above it for this 'photoshoot' and didn't have anything else. 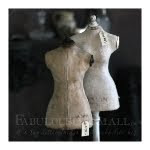 It will - of course ;) - become part of the Oldtique Store interior where its size will be perfect in the bigger space. and to put the two together, here's the before and after. as you can see, I also put a different kind of cap on top of the shade, something I had in my trash-treasure-stash. Don't have a clue what it is, but was so happy I had it! The little coil on top of it comes from a bronze earingbase, cut in half. They both had the colour they're in, the bottomring of the pendant I removed by warming and softening the glue and fired the ring on the stove to get the natural aged bronze-look. The electrical wire is thin twisted wire from Modeltrain Software I had and I 'painted' with some Tacky glue to make it a bit more cohesive and slightly thicker and then painted it black. What wonderful pictures! I just love the fruit...it is so realistic and thank you for sharing the link. Both bowls are wonderful. What incredible craftsmanship. They look awesome on the green marble...good call by the way, you made a very handsome piece of furniture even better. As for the lamp, I think the shade works really well as a hanging lamp! Hi Giac, thank you for you great compliments :D! I LOVE that maple bowl! The sideboard looks much better than the "before". I would never have guessed the top was covered with a decal. You made great use of the oversized/undersized lamp! it's amazing isn't it? I can't believe how anyone has been able to make it, in reality it's so superthin, it feels like thick paper or thin cardboard. How anyone could have made a piece of (delicate) wood into it is a mystery to me, but I'm so happy I can enjoy the amazing result! :D And thanks for your great compliments! 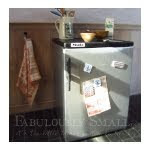 Amazing items!! I love the wood bowl and the stunning fruit. 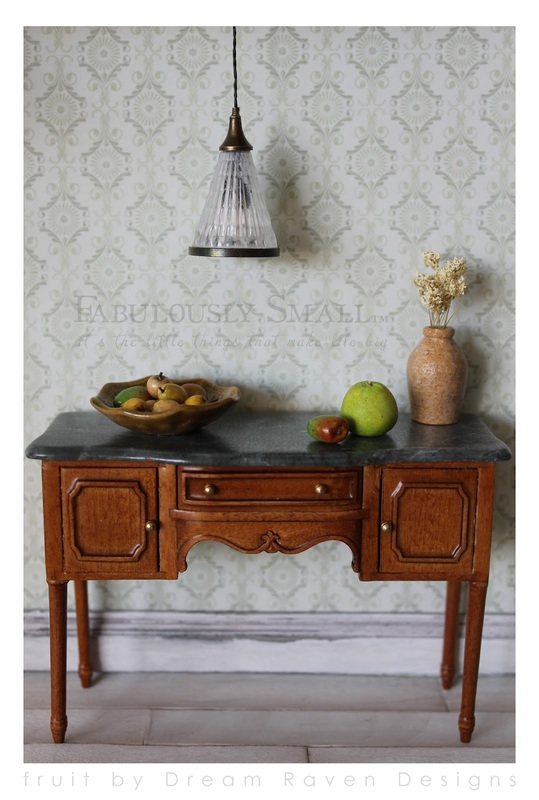 The marble on the sideboard is beautiful! That is a very realistic decal. Love, love, love! 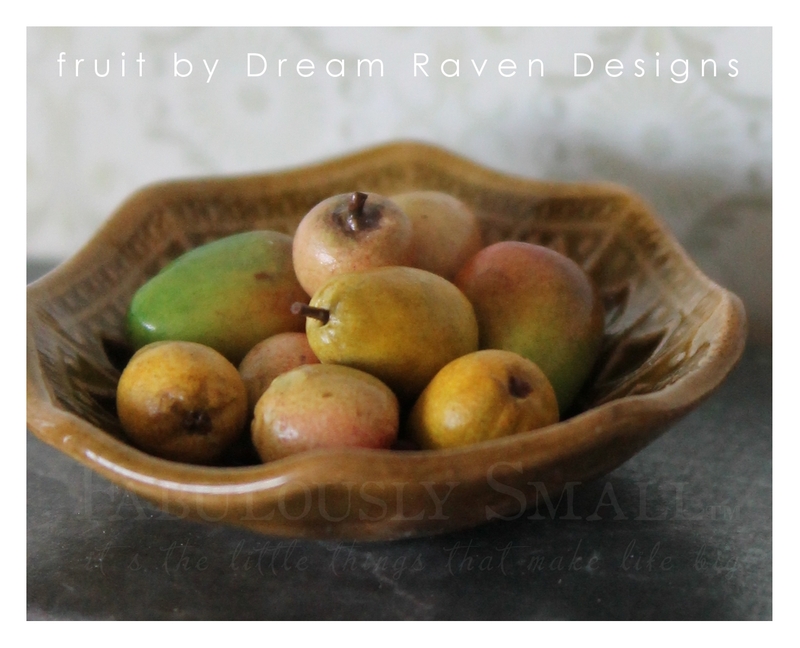 The miniature fruit is the perfect complement to the wood bowl and they look perfectly lovely together! The refinished sideboard has been taken up a notch and looks great in its new colour scheme...you've given me the courage to do something similar with a piece that is currently languishing...thanks for the great post! I think so too, they complement each other well, they both deserved quality and they got it right? ;) I'm so happy my dresser-makeover has given you inspiration to do something similar at last, I hope it worked out as you hoped? And your so welcome, it's always a pleasure! As usual, you have worked Wonders with the ordinary minis!!! The lamp is perfect because you did so many little "alterations" from a disappointing original! And the marble top for the sideboard is so "right" it looks as though it always was like that if you know what I mean! More and more Treasures for the "Oldtique Store".... I can't wait to see them there!!! it's amazing isn't it, I love it too! So funny how I was so disappointed when I got it, being so light and so incredibly thin, like I said, it felt flimsy, but in the photo's: perfect! That's an idea too, I really thought of it as a fruitbowl, but of course it would be great to display all sorts of items :D. Thank you for all your kind words and compliments Betsy and I can't wait to see all my stuff in the Oldtique Store either, I really hope it's possible to have it build this year! That is a great decal! Thought you purchased it like that. thank you Audra! haha, nope, it's an image of marble I found online and thought to have the right ratio, scaled it down and printed on decalpaper, such great stuff! Hi Monique! Inderdaad, wát een prachtige kom voor je nieuwe én mooie vitamientjes (kan ook geen kwaad met die griepepidemie, hè ;O? ), hierin komen ze extra mooi uit. Je ziet idd niet vaak een miniatuur in hout dat zo mooi dun is: vakwerk! 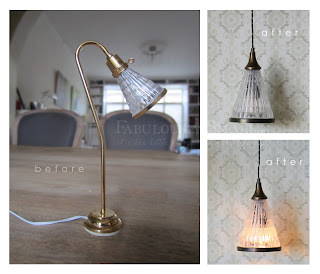 Je hebt overigens dat vreemde "is-het-net-niet"-lampje een mooie makeover gegeven, het past nu uitstekend bij je mini scène, prima werk!! Dank je wel, ja vreemd he, die lamp, ik vroeg me echt af of het nou aan mij lag, maar kan er echt niets van maken ;). Ja he? Ik ben er ook zo blij mee! En het is wel een heel ander weekend inmiddels, maar wens em net zo goed fijn te wezen (da's een rare zin, maar je snapt me wel he?)! Oh that fruit is genuinely making me crave the real thing! I love the two bowls too - the ceramic one has such a lovely glaze, but I think the wooden one is my favourite. Hi Christine, it's very real isn't it? I think so too, the funny thing is that the post was originally centered around the ceramic bowl and the wooden one was just to try that one out, but it's my favorite too, it's super! the bowl is beautiful, when looking close you can clearly see the grain of the wood. I like that way much better than clay ones. 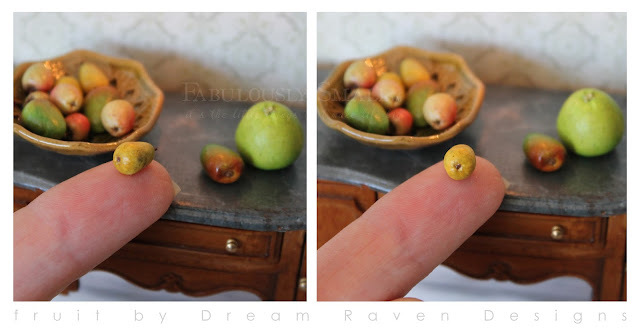 Also the fruit is very realistic; it is this finds that make a miniaturist watermouth (the realisme and the fact that it looks tasty). this way you are building a great collection that you and others will love for ages. thank you Gee, I totally agree! 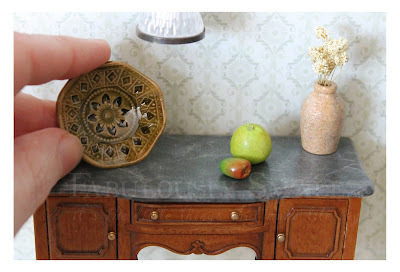 It is always such a joy to see how incredibly real miniaturists are able to make things and I feel priviliged to have such pieces that make me very happy each time I see them :D.
That wood bowl is gorgeous! I love the ceramic one too. You did a great job re-doing that sideboard. It looks like a perfectly scaled piece of marble. I had no idea they make decals like that. Also a beautiful make over rescuing the shade for a pendant light. It's lovely! Hi Catherine, it is indeed! And thank you, haha, they don't, it's an image I found of google that looked like marble right in ratio to be scaled down and printed it myself on decalpaper. I love what you did to that lampshade. That states never to give up on anything that might not seem to have the right size or a purpose now. It will often be that perfect missing part one day in another project. 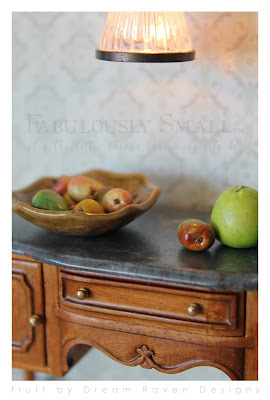 The wooden fruit bowl is wonderful. I will look for something like it when Swan House MIniatures displays on the dollhouse fair here in Denmark i april. Thank you Annie, you are so right. Oh, I really hope you find something similar, that would be awesome, good luck! He does have some bowls by the same maker, but in his webshop just not as lovely as the one I got back then I'm afraid and I also don't know if he will have any with him, but who knows, and maybe some new/different ones, keep our fingers crossed! You're welcome, her work is so worth taking a look! CRTL Z haha love it, would that not be sweet in RL!!! So fun how we see the finished scene then slowly arrive at it! Warm green is very nice, not a big fan of cool green either. The bowls are both beautiful, but I was taken by the maple bowl. Oh the thin-ness is wonderful and great scale. Looks perfect with the wonderful fruit. Thanks Linda, it's always nice when others enjoy miniatures as much as we ourselves do, get our enthousiasm about them :D! Fabulously small, but also fabulously beautiful, Monique!!! 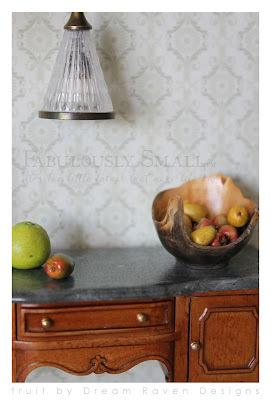 Great wooden fruitbowl, and very good makeover with the lampshade! 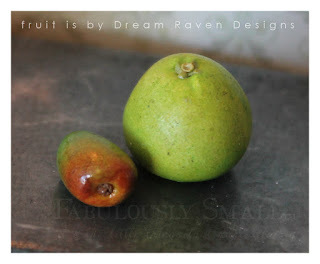 Fruits are so realistic...You are a big artist!!! thank you so much Noelle, for your sweet comment. Although I can't take credit for the bowls and fruit, but they are indeed fabulous! More fabulous from your fabulous hands Monique! I love the marble top you gave to this classic sideboard and the upcycled lamp is great! Love the fruit and both bowls are gorgeous. Lovely little scene, you can't tell what scale, it looks life size. The fruit bowl is gorgeous. It's all beautiful, I love the lamp. thank you Polly, and the lamp is much better isn't it? Hi Elizabeth! It makes sense to associate the organic shape of the bowl with green and green also compliments the wood of the bowl perfectly. So 'green' suits this post in even more ways than I already thought! I really like your remark about the combination of styles, I thought they went well together and it's always so nice when others can enjoy it as much, thanks! I LOVE that maple bowl and the shape of wooden one! The sideboard looks much better than the "before". Great ,minimalistic scene! Lamp is much better too. Hi Sigrid, thanks for stopping by and your compliment :D.
That was quite the disappointment wasn't it Brae? ;) It looked so nice in the picture, but it's just a weird lamp, haha. Luckily it's salvagable and I'm sure you'll be as happy with it as I am once you've done the alterations on it. I look forward to seeing your result. It's an amazing bowl isn't it? I totally agree it's the star of this post :D ! 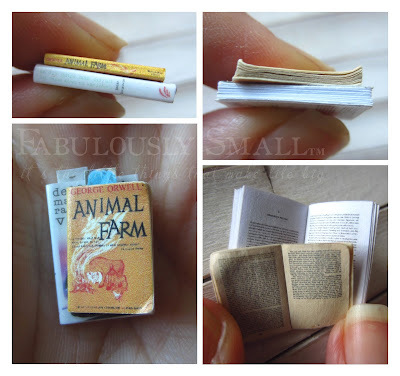 Your miniatures always amaze me!!! Your style, details and beautiful photos are my favourite of all!!! Cant wait to see more!! That is such a great compliment, you make me blush, but thank you Nielcia!! Awesome work, the rest of your mini's too.